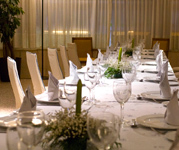 Hotel San Antonio has various rooms and halls for celebrating all types of events from weddings, holy communions, baptisms, company dinners…. to congresses or company assemblies. The Conference Hall has Free Wi-Fi, air conditioning, megaphone, projector, loud-speakers…it is the ideal place to celebrate in total peace and guaranteed success congresses, conventions, seminars and work meetings. 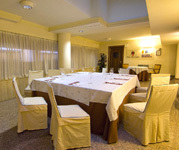 The banquet room of Hotel San Antonio has an area of 120 sq. m and can seat 110 diners.